It's time to party like it's your birthday with this blend that is going to put you into a celebration ready kind of mood whenever you're able to inhale its sweet, familiar flavors that you remember from all of those years ago. Have you ever seen those amazing bakery pictures on social media where they make their desserts look way too good? After looking at them, you without a doubt start to get those rumbling in your tummy and feel your mouth start to water. We can't enjoy treats like this every single day so having a guilt free, calorie free alternative like this around is going to be a lifesaver! This is one of those great arrangements of flavors that can kind of instantly bring about feelings of pure joy and carefree excitement that is going to have you smiling from ear to ear and put you into the mood to get out there to have a little bit of extra fun. So sweet, creamy, decadent and smooth, if you have a sweet tooth this is definitely one of those blends that you without a doubt just have to try. 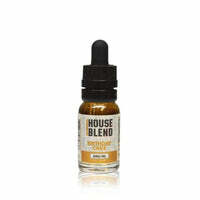 House Blends E Liquid makes high quality, creative blends in smaller sizes so that you can save money and be able to try a wide range of different flavors. You know what people say, variety is the spice of life and you are going to be able to make the very most out of your mod with the fabulous selections from this collection around. Birthday Cake has that classic, moist vanilla cake base that is layered with creamy vanilla icing that adds an irresistible richness that will leave you absolutely satisfied. Birthday Cake - House Blends E Liquid has a rating of 5.0 stars based on 1 reviews.